McHenry Excavating, Inc. offers the correct solution for your foundation every time. When repairing a sinking foundation helical piles are becoming the most common product to use. We install Magnum helical piles because they are extensively engineered, manufactured using only 100% NEW US ASTM513 steel that is produced specifically for the construction industry, and backed by a twenty-five (25) year warranty. They are built to exceed the industry standards set forth by ICC-ES, which ensures the product will hold MORE than the weight of your home. Our partnership with Magnum ensures that the project will be completed correctly the first time and installed to last! Expose and face footer even with the load bearing wall. Install lead section of helical as close to the faced area as possible while monitoring the torque on the pile. Add extensions using the single bolt connection until desired torque or depth is achieved to support the load. 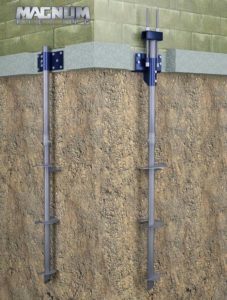 Slide selected foundation repair bracket over the exposed tube and attach to the faced footer using wedge anchors. Lift home to desired position using Magnum rams or lifting. Drill the pier and lock in place using the proper amount of bolts for the load. At McHenry Excavating, Inc., we take pride in our work and treat your home as if it were our own. Our client’s notice this by the workmanship that we provide, but it all starts with the materials that we use. That is why we have chosen to become a Mangum Certified installer. Magnum has been designing foundation repair systems for over 35 years, has been used in over a million projects, and are the go-to material for numerous engineers across the country. Magnum’s material separates itself from other manufacturers because it is 100% NEW US ASTM513 steel, designed specifically for the construction industry and backed by a thirty (30) year warranty. The installation process is less invasive and is installed quicker than our competitors. We don’t believe in a “one size fits all” approach because, let’s face it, all homes are not built the same. Our partnership gives us the capabilities to choose the right bracket and pier for your home. During the install, every pier is tested to ensure it can support MORE than the weight of your home. Let McHenry Excavating, Inc. and Magnum repair your foundation right the first time. Fasten the bracket to the footer using the proper amount of wedge anchors for the load. Secure the ram to the bracket with a safety bolt. 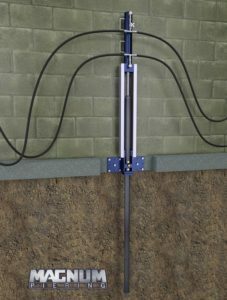 Drive the 36” pier sections connecting them with the ID coupler system. After all piers are driven and tested, the same rams can be used to lift the structure.